ISLAMABAD: Feb 08, 2019- Information Minister Fawad Chaudhry has said the country has been riddled numerous problems, including the huge debt burden left by previous governments. He was addressing a book launching ceremony which held in National Press Club Islamabad on Friday. Minister of Information and Broadcasting Chaudhry Fawad Hussain was chief guest. Addressing the ceremony, he said the message of Imran Khan was on equality, supremacy of law and eradication of corruption. Chaudhry Fawad Hussain said the sit-in lead by Imran Khan gave an alternative message to youth and that was the laying stone of a new Pakistan. 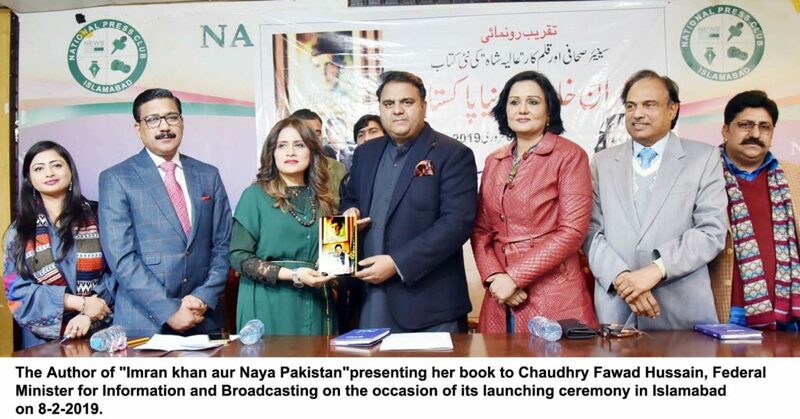 The book titled “Imran Khan and New Pakistan” has been written by journalist Aliya Shah. It details political events andcomprises stories including National Elections 2013, the sit-in, PTI, PML-N and PPP’s political stunts, strategies and dramatic politics of this decade. The book especially focuses on the political journey of Imran Khan and his struggle from dharna to becoming the prime minister.